After a very uneventful Friday night for me, I decided I deserve to go out and have a little fun so as planned, I went out for a quick drink with the girls. 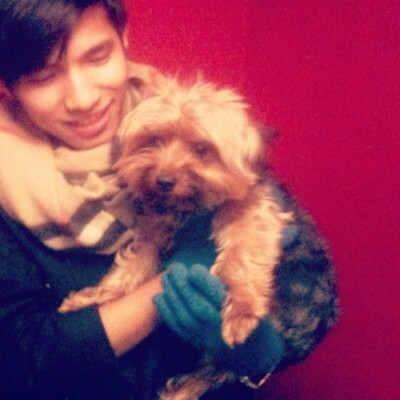 My friend Kristina has this super cute little dog, his name is Kingston, and he’s a Yorkshire Terrier. I can only imagine if I were to have a dog, it’ll be as little as Kingston, so much easier to deal with, you can grab him and go. Next photo on the right is DannyBarr’s key set. That’s a pretty good 5 lbs. there I tell you. 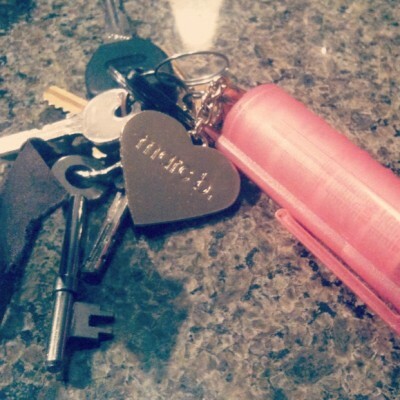 She also has her pink pepper spray attached to it. Fun ei?! The plan was to go to the closest bar, but the line was massive and we’re not fond of it so we walked around for a bit trying to find a nice place to just hang out and have a drink. We ended up at 131water, Kitchen & Bar. I was a little disappointed because I was very hungry but our server said we can only order from the appetizer’s menu. So when I finally decided to get a Chicken quesedelia, I was informed they no longer have that for the night either. I was left with no choice but to have some barbeque Buffalo wings. It was very nice to just hang out with the girls. I do see them often at work but it’s great to be with them in a different environment — as expected, it was really fun. I got home at around 1:30am and my sister was still up watching a movie. We had a little talk, I told her about my night, we messed around, giggled, and then we agreed to watch a scary movie. Thank God for Netflix. We watched “Asylum” and oh boy, wasn’t that super scary. And nothing ends the night than a soothing warm bath. I love simple Saturday nights like this, not too crazy, and not a snooze night either. Looking forward for today. My sister and I planned an afternoon drive, we’ll see how that goes.